On a sunny day in Oakland, California, more than a hundred kids at Laurel Elementary School spill outside for recess. They race across the blacktop, screeching and laughing, to jungle gyms, the basketball court, and a LEGO Lair. Others grab hula hoops, as two first-graders struggle to roll out a soccer net. A multisport athlete and two-time national club-rugby champion, Vialet founded Playworks’ precursor, Sports4Kids, in 1996. She’s since scaled up the model, supported by more than $32 million in grants from the Robert Wood Johnson Foundation and a 2006 Ashoka fellowship. With nearly 700 employees in 23 offices around the country, Playworks expects to reach 1.25 million children at 2,500 elementary schools this year—the majority from low-income families and neighborhoods. Awareness of its programming, Vialet says, is largely through word-of-mouth; Playworks contracts with individual schools as well as districts. Services range from on-site, full-time “play coaches,” to staff trainings, to consultations; Playworks defrays poorer districts’ program costs through fundraising. At Laurel Elementary, Playworks program coordinator Tayla Muise leads all the recesses, striking that sweet spot between structured and free play that Vialet (pronounced “violet”) enjoyed while growing up in the relatively leafy Cleveland Park section of Washington, D.C. But while she played outside with peers every day, she finds that many students now don’t, regardless of socioeconomic status. Whether that’s because of digital devices, parental fear of “stranger danger,” or objectively unsafe neighborhoods, they lack “the breadth of knowledge about how to play or start games,” she says—and especially how to keep them going after a disagreement. Vialet aims to right-size play and recess in children’s lives. Because the Bay Area promised more adventure than moving back home (and she could stay with her College roommate’s parents), Vialet landed in Berkeley after graduation. Then she began showing up at a progressive asset-management company “every day at 7 a.m., and kept asking, ‘Is there anything I can do?’”—figuring she’d build on her divestiture efforts at Harvard—until she was offered a job. Within 10 months there, she learned that financial-services weren’t for her, but maybe an idea and business plan she’d developed, to make art a fundamental part of every child’s daily life, might work. That became the Museum of Children’s Arts, in Oakland, which she founded in 1991 and led for a decade. While there, she met with a principal concerned about three boys whose behavior on the playground was causing trouble and contributing to their self-images as “bad kids.” She asked Vialet for help. It struck Vialet then that thoughtfully planned play, like art, had potential benefits, and that recess, if “tweaked,” would have a huge impact on entire school systems. 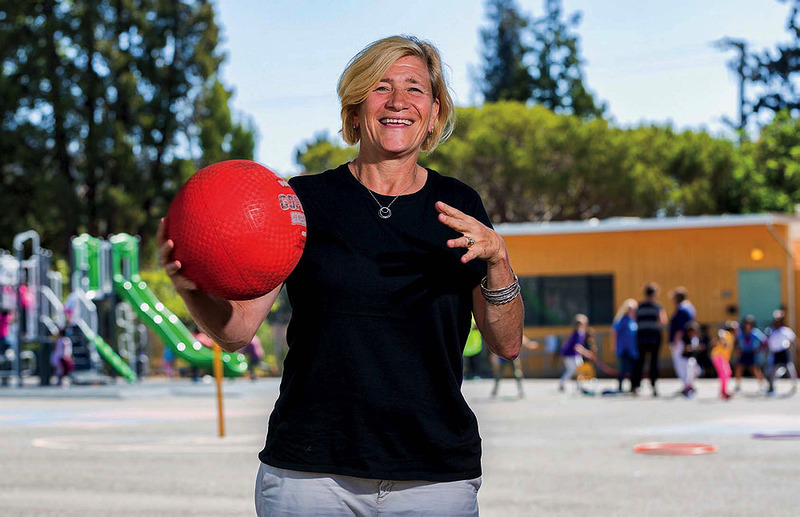 These days, Playworks is still expanding, with Vialet’s partner, long-time nonprofit leader and activist Elizabeth Cushing, as its president, primarily in charge of operations. That frees Vialet to focus on “vision, fundraising, and having big ideas.” During a 2016-17 fellowship at Stanford’s Hasso Plattner Institute of Design, she forged a new nonprofit, Substantial. “At any moment, 10 percent of classrooms are led by substitute teachers,” she asserts, “so kids spend a full year of their K-12 education, and schools spend $4 billion a year, on subs, and 90 percent of districts offer four hours or less in training.” A digital platform to help teachers better communicate with subs about classroom curriculum, workflow, and assignments is in process. She’s also busy building a for-profit Playworks division, Workswell, that applies the games and play model to adults in the business sector. Vialet works hard—but sometimes plays harder. “In the nonprofit community, people do this martyr thing and work these ridiculous hundreds of thousands of hours,” she says. “People are always surprised that I actually put in about 40 hours a week.” As a thought leader on play and an advocate for balanced lives for kids, she says, “practicing that yourself is important.” Compulsive list-making and integrated projects (e.g., Substantial has office space at Playworks) is pivotal, as is an annual silent retreat, and daily meditation and exercise—running, biking, weight-lifting; “I spend as much time outside as is humanly possible.” A solo hiking trip to Yosemite this summer was followed by backpacking along Northern California’s Lost Coast Trail with Cushing, with whom she also has a blended family of five children. “Being a mom is a big part of my identity and mental energy and happiness,” she says—another piece of her balancing act.